Lenovo is making some changes to its premium lineup—though only diehard fans (and a tech reporter) may notice. Instead of the “Yoga” moniker denoting only convertibles and flexible PCs, Lenovo will now use the name on all of its premium consumer devices. Yes, we’ll start seeing Yoga laptops in addition to Yoga two-in-ones and experimental devices, but today we’re taking a look at Lenovo’s answer to the Dell XPS 13 convertible and the HP Spectre x360 13: the Yoga C930 2-in-1. The new C930 convertible replaces last year’s C920 and attempts to fix its problems, mostly surrounding speaker and stylus placement. It’s also one of the first Yogas to leave Lenovo’s signature watchband hinge behind, instead opting for a solid metal hinge that doubles as a sound bar. It’s likely to be one of the most traditionally Yoga-like devices in the new premium lineup, and its small yet crucial upgrades make it much better than its predecessor. The Yoga C930’s chassis and lid resembles that of the C920—all metal rectangles wearing a satin finish, the lid’s top-left corner stamped with a shiny Yoga label. Sadly, the lid holds onto fingerprints and smudges more than the chassis does, but the uninterrupted metal look is nonetheless sleek and professional. Weighing 3.04 pounds, it’s as heavy as other ultrabooks in its size and price range. Its powerful internals prevent it from being the thinnest or the lightest, but it strikes a good balance of style, lightness, and performance. The Yoga C930 convertible comes in iron gray, white, and blue. Aside from the blue model, which has a strange, wavy design on the lid, Lenovo opted not to pepper the notebook with metallic lines, soft-touch accent areas, or other conspicuous accents. I appreciate that decision; today, it can be difficult to make an attractive notebook that has a unique yet premium design without employing some of those tricks, but Lenovo achieved that with this convertible. Like other convertibles, the C930 suffers from huge-chin syndrome featuring a one-inch-wide bezel underneath its display while the side and top bezels are mere slivers of black. The top bezel is roughly double the width of the side bezels because it houses the webcam. While the C930’s keyboard has a camera-disable button, Lenovo also built in a physical camera privacy shutter (dubbed TrueBlock) above the webcam. 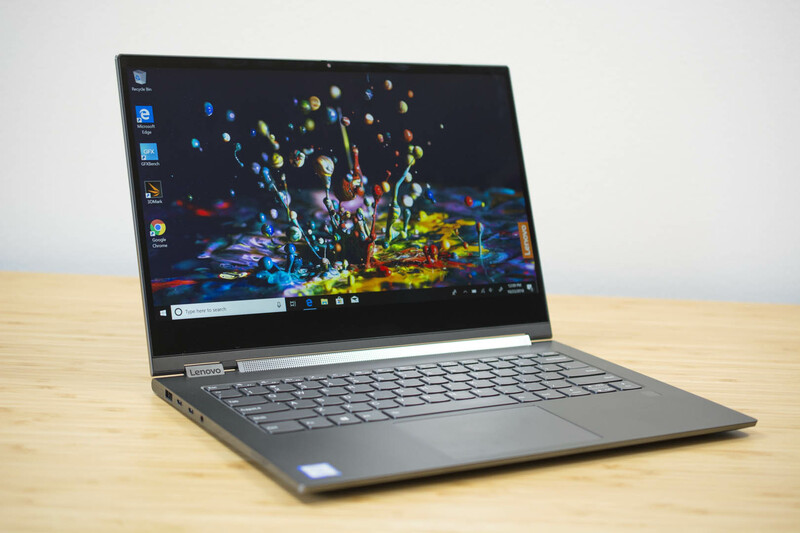 It’s much thinner on this convertible than on other Lenovo notebooks: its grooved notch is so tiny that it’s almost invisible, so you may have to find it by running your thumb over the webcam. Users can slide the shutter to cover the webcam whenever they please. The 13.9-inch touchscreen comes in an FHD panel or a 4K panel, and both support Dolby Vision HDR. It’s a nice perk to have, particularly for anyone who watches a lot of Dolby Vision content (Netflix, iTunes, and other services have some now). However, with the screen maxing out at 300 nits of brightness, your naked eye likely won’t notice a huge difference, and it certainly won’t be the same as watching HDR content on a TV screen. Lenovo revamped the convertible’s audio to complement the enhanced screen, hoping users will see it as a prime media device as well as an all-purpose ultrabook. Instead of the down-firing speakers in the C920, the C930 has a Dolby Atmos sound bar in its long hinge that connects the lid to the chassis. No matter how you use the C930—as a laptop while doing work, in tent mode to watch YouTube videos, or as a tablet while sketching—the speaker rotates to always face outward so sound can remain unmarred by desks, tables, lamps, and other surfaces. Sound coming from other devices can easily get muffled due to the speaker’s placement. Lenovo’s solution is one of the most clever I’ve seen that doesn’t impede the overall design of the device. Nixing the watchband hinge for this sound bar hinge served a practical purpose while also maintaining the device’s premium look. The C930 comes with Dolby Atmos Audio software to enhance its new speakers, which lets you choose customized sound preferences for movies, music, games, and voice. There’s also a “personalized” profile that you can customize further by manipulating the surround visualizer, dialogue enhancer, and volume leveler. The speaker itself is just fine, but aside from the fact that it was never unintentionally blocked, it didn’t wow me. I expected it to be much louder than it actually was: while on the default Atmos Audio sound settings, I turned the volume up to 100, and, unlike when I’ve tested other laptops and convertibles, I wasn’t afraid of my neighbors being irritated by the loud music. It’s boisterous enough to fill my entire living room and tiny, attached kitchen, but the music was faint when I moved to the opposite end of my apartment. Lenovo’s Yoga C920 convertible ditches the watchband hinge for a sound bar hinge. It runs on a Core i7 Kaby Lake R processor and Intel HD Graphics 620. Weighing 3.04 pounds, it’s not the lightest ultrabook, but it’s not super heavy either. Scant port options include one USB-A port, two Thunderbolt 3 ports, and a headphone/mic jack. The uninterrupted iron gray finish on our review unit is quite attractive. The sound bar extends the length of the main part of the hinge and supports Dolby Atmos audio. Even without the watchband hinge, it flexes easily into tablet mode. The new privacy shutter covers the camera and is barely visible in the device’s top bezel. Lenovo went all-in with Dolby on this one, and it may convince some users that the C930 is better equipped as a media consumption device. Although, I think its convertible design and the Dolby audio profiles do more for the device than the HDR features. The flexibility of convertibles makes them inherently better for watching videos and listening to music since they can fit better into nontraditional environments. Since HDR on portable PCs isn’t quite the same as HDR on TVs, users will likely notice the audio improvements (particularly those they choose to edit and customize) more than the visual ones. The C930 also has new far-range mics so it can pick up commands you say to Cortana and Alexa. As far as connectivity goes, Lenovo rearranged the ports slightly on the C930, but it doesn’t gain or lose anything significant from the C920. Only the power button lives on its right side, while a USB-A 3.1 Gen 1 port, two Thunderbolt 3 ports, and a headphone/mic jack sit on its left side. While I appreciate including a USB-A port, the device would benefit from some kind of card reader, be it a regular SD card slot or a microSD card slot. The C930 borrows some design elements from ThinkPad keyboards, although the two aren’t exactly the same. The keys have that rounded-with-a-flat-top look, but their 1.3mm of travel isn’t the same as that on ThinkPad devices. There also isn’t a TrackPoint in the center of the keys, which will disappoint some. However, I enjoyed typing on the C930 even if it couldn’t replicate my experience with this year’s ThinkPad X1 Carbon. The space below the keyboard holds a moderately sized trackpad and a fingerprint reader, the latter of which sits underneath the arrow keys at the bottom-right corner of keys. The C930 convertible doesn’t come with an IR camera, nor is it an optional feature, so the fingerprint reader is the only form of Windows Hello biometric authentication available. When looking down at the keyboard and trackpad, the chassis looks pretty standard. But hidden in the back corner of the C930, diagonal to the power button on its top-right corner, is a garage that holds the active pen. Like most convertibles, last year’s C920 didn’t have a good way to keep its active pen in check. Lenovo fixed this on this year’s convertible by sticking the pen into the device, where it sits waiting (and charging) for you to use it. The pen itself isn’t my favorite—it’s short and quite thin, making it difficult to hold and nothing like holding a regular pen or pencil. But it does make up for that with its pressure sensitivity and low-latency performance. Its two side buttons also come in handy, too, giving you quick access to erasers, right-click menus, and more (depending on the program you’re using). While the active pen won’t win any ergonomic awards, I love its home in the C930 because it makes the pen one less thing I have to remember when I take the convertible out of my office or out of my home altogether. It’s great that Lenovo includes the pen in the C930’s price, but it’s even better that it’s kept neatly and securely with the convertible at all times. The active pen is almost always accessible, too, only blocked by the lid when it’s at a specific angle. The keyboard looks similar to those on ThinkPads but doesn’t quite feel the same when you type. It’s still a great keyboard, though. The active pen garage sits on the back corner of the C930 convertible. The active pen stays safely stored in the garage when you’re not using it, and the garage charges it, too. The active pen is too thin and short for my liking, but it works fine for light sketching and note-taking. Our review unit of the Yoga C930 2-in-1 runs on a Core i7-8550U processor, Intel HD Graphics 620, 12GB of RAM, and 256GB of PCIe SSD. Unsurprisingly, it served me well as my primary work notebook during my testing days. I never experienced any lag or stuttering, although the fans were quick to make noise even when I was doing fairly light Web browsing. They aren’t anywhere near as noisy as the fans on Huawei’s Matebook X Pro, but you’ll be able to hear them if you’re working in a quiet room. We’re interested to see how the Yoga C930’s performance compares to that of the updated Spectre x360 13, which will be available this November. Lenovo estimates the Yoga C930 convertible will last between nine and 14 hours on a single charge, and our testing proved that to be true. It lasted an average of 767 minutes, or just under 13 hours, on our Wi-Fi battery test and an average of 674 minutes, or just over 11 hours, on our WebGL test. That’s an above-average Wi-Fi score and a killer WebGL score, as all of the top competing devices (Matebook x Pro, XPS 13, Notebook 9 Pen, and others) lasted half that amount of time on the graphics-intensive test at best. Lenovo is particularly good at taking important features—webcam shutters, booming speakers, integrated active pens, and more—and thoughtfully incorporating them into a device’s design without using gimmicks. Lenovo’s notebooks, the C930 and the ThinkPad X1 Carbon alike, may not be the flashiest ultrabooks available, but they are understatedly attractive while being powerful to boot. That being said, the Yoga C930 isn’t the device for you if you want a lighter, more customizable device that also has that signature ThinkPad keyboard experience. The X1 Carbon scratches that itch, and you’ll pay for it with the device’s higher price tag. But the Yoga C930 targets those who are considering a Spectre, an XPS, or a premium Samsung convertible. I’m still curious to test out the updated Spectre x360 13 and to see if and how Dell updates the XPS 13 convertible in the coming months. However, anyone looking to upgrade their convertible now has a solid new option in the Yoga C930. Standard Dolby Vision HDR support. Sound bar hinge ensures speakers will remain unblocked at all times. New far-range mics for Cortana and Alexa support. Built-in garage to hold and charge active pen. Speakers aren’t as loud as they could be.